ESSEX STREET is pleased to present an exhibition of Pati Hill (1921-2014). This is the first solo exhibition of the artist’s work in New York since 1979, when she had her fifth and final exhibition at Kornblee Gallery. This exhibition, like almost all of Hill’s 40 year oeuvre, consists exclusively of photocopies. Pati Hill was born in Kentucky and spent most of her adult life between New York, Connecticut, and France. Her first career was as a model in the 1940s and she appeared on the cover of Elle, Harper’ s Bazaar and other magazines. Nearly simultaneously Hill worked as an author, contributing to Seventeen and Mademoiselle at first and then eventually for the Paris Review. Hill’s first book, The Pit and the Century Plant was published in 1955, and like most of her work it obscures the line between memoir and fiction, between recreation and invention, between the real and the recorded. Hill would publish a total of ten books of varying lengths and formats including novels, poetry, and a manifesto of her own working methods. In 1956 Hill met Paul Bianchini, whom she would go on to marry in 1960. Bianchini’s New York art gallery gave the first one-person exhibitions to Lee Lozano and Sturtevant, as well as the American Supermarket exhibition including Andy Warhol’s Brillo Box. The following year, 1976, marks the publication of Hill’s masterpiece novel IMPOSSIBLE DREAMS, a woven narrative of a nameless woman, the dissolution of her marriage, and the falling in love with her neighbor Dolly. In the very center of the book, on two pages starting with 66, across the spine is the word “Dolly” 393 times, the final iteration rounding into “Dolly rebounds from the four mirrored walls.” Alongside pages of text are full bleed reproductions of black and white photocopies, all of which derive from photographs, many by well-known photographers including Robert Doisneau, Lucien Hervé, Eva Rubenstein, or from press archives. In the front of the book, atop the dedication page Hill writes “The photographs in this book have been processed to give them greater unity.” To reiterate, in 1976 Pati Hill published a book of black and white photocopies of other photographers’ work. A friend who was employed at IBM’s New York headquarters gave Hill a set of keys which allowed her access over the weekends to work on their machines. Eventually, through a 1977 chance meeting on board a flight from Paris to New York, Hill met Charles Eames, who successfully encouraged IBM to loan Hill her own machine. The following year in 1978 Hill exhibited at Kornblee Gallery A Swan: An Opera in Eight Acts. This work consists of 32 black and white photocopies of a large dead swan that Hill found on the beach. Twenty nine of these photocopies derive from surveying the entirety ofthe swan’s feathered body. The remaining three are derived from the swan’s heart and skeleton which Hill derived by a butcher. In 1979 Hill published three works in her own issue of Top Stories, an experimental feminist prose periodical coming out of Hallwalls in Buffalo, that also made issues with Laurie Anderson, Constance DeJong, Lynne Tillman, Ursule Molinaro, and Kathy Acker. In 1980, after including work in a group exhibition at the Pompidou in Paris, Hill reached out to the chief curator at Versailles, asking him for permission to photocopy the entire palace. She was successful in this request, and undertook the project in various forms for most of the rest of her life. Hill photocopied everything at Versailles from the dirt, to the paving stones, to printed surfaces, to a pear tree, anything that she could lift or lean across the surface of her machine. 9. It is the side of your subject that you do not see that is reproduced. 10. The copier works on a yes-no principle. 11. There is no side of the picture that is “up” in a copier picture except the side you designate as up. are using it for, as mentioned earlier. Included in the exhibition at ESSEX STREET, are four bodies of work made between the years 1976 and 1983. There are works derived from garments, a body of work Hill exhibited in her second exhibition at Kornblee in 1976 and published in New Letters. There are several works derived from common objects, which had occupied Hill’s oeuvre from the start. 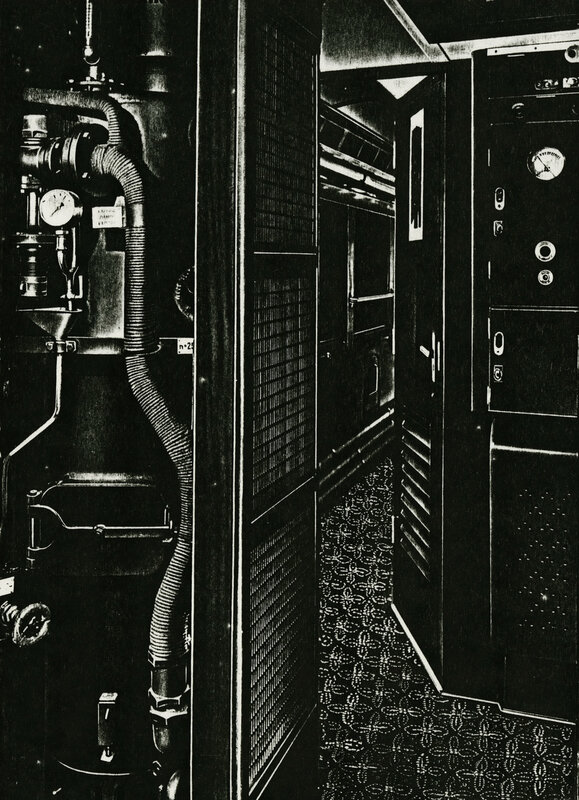 There are several works derived from publicity images for train cars, which Hill exhibited in her fifth exhibition at Kornblee in 1979. There is one large work in 15 parts, all derived from a contortion of the same silk scarf, which Hill exhibited in her 1983 exhibition at Galerie Texbraun in Paris. indigenous to the copier and to the future. All works are lent from the Estate of Pati Hill and Arcadia University, Glenside, Pennsylvania.